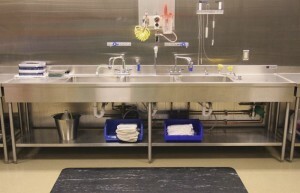 CMP’s Adjustable Height Decontamination Sink Improves SPD Ergonomics. Continental Metal Products’ Adjustable Height Decontamination Sinks provides a unique solution to help maximize ergonomic benefits and minimize safety hazards in the Sterile Processing Department. Ergonomics should be a key consideration for a healthcare facility when designing a SPD space. CMP recommends that hospitals make these spaces as ergonomic as possible. It is important to take into consideration the height and accessibility of equipment. Simple changes in design can make a tremendous difference. In a recent SPD renovation that CMP collaborated with on the equipment design, clinician height ranged from 4’9″ to over 6’4″. CMP’s Adjustable Height Work Sinks feature seven inches of vertical height adjustment. This feature accommodates clinicians of various heights. In this way, repetitive strain injuries are reduced that have been associated with excessive bending and reaching. Additionally, safety hazards associated with washing dangerous and/or sharp objects are decreased. CMP has been a leader in Sterile Processing Department stainless steel equipment design for over 69 years. CMP’s stationary or fixed height processing sink models and Pass Through Windows help SPD meet AAMI guidelines. CMP is excited to add automatic height adjustable configurations to its line of sink workstations in order to assist SPD professionals’ ergonomic needs. These ergonomic height-adjustable processing sinks, maximize productivity by reducing clinicians’ fatigue and discomfort. Neck and back strain is eased by reducing bending, reaching and stooping. Available in three configurations; Single Sink, Double Sink, and Triple Sink decontamination work-sinks accommodate a wide variety of workflows and processing steps. These sinks and countertops are designed to accommodate large instrument trays and containers. CMP’s Clean Up Counter with Adjustable-Height Legs provides optimal infection control. CMP’s durable stainless steel reprocessing sinks meet the stringent AAMI (Association for the Advancement of Medical Instrumentation) guidelines for maximum sterility and utility. CMP’s most popular configuration adheres to the AAMI recommended three-bowl functionality. Reprocessing Sinks / Clean Up Counters can be customer-specified for either left or right workflow direction to increase efficiency. All necessary plumbing components are included. Counter space is provided on both sides of the sink. The deep sinks allow for full immersion of all surgical instrument trays. The underside of the top is reinforced with no. 16 gauge channels to prevent warping or distortion. Front and two sides of workstation shall have a no. 18 gauge stainless steel apron to conceal sink bowls.